The spring/summer 2019 runways offered fresh trends that inspired our future wardrobes beyond belief. Between the California aesthetic filled with tie-dye and bucket hats, plus the triumphant resurgence of the bike shorts, there was a lot to take in. And while the ready-to-wear collections were a sight of their own, the shoes that accompanied them were unlike anything we'd seen before. Narrowing down the shoe trends that shocked us the most this season took way longer than expected. Our jaws continued to drop show after show as the footwear trends got crazier and crazier. Feathers, neon, tourist sandals, and more are about to grace the inside of your closets, so we're here to prepare you as well as we can. Ahead, take a gander at some of the most shocking shoe trends of 2019 as they came down the runway. Take your love of shoes to new heights with a fresh pair of platforms. 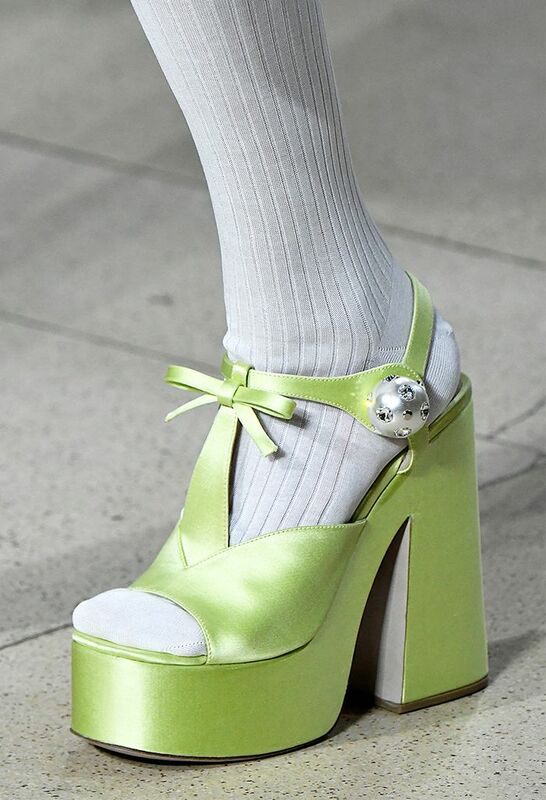 Thanks to the overwhelming presence of this shoe style on the runway, it's safe to say they're officially back. There's no fam like a feather fam. No matter what the shoe style, feathers are proving they're the addition your soles and your soul needs. However, feather-adorned shoes are the shoes that always warrant a comment or two (or three). News flash: Neon isn't just reserved for hoodies and handbags. This season, embrace the highlighter hues by way of pumps, sandals, and more. That's right, the jewels are included. Designers decided to drip crystals and chains alike from everything from pumps to boots. So basically, screw anklets; buy these shoes instead. The Plastics are back, but this time they're playing nice. If you're officially ready to bare it all, slip into a pair of these plastic shoes, whether they be '90s-inspired jellies or beaded kitten heels. Ballet flats are nothing like they used to be as proven by designers like Off-White, Dior, and Stella McCartney. The addition of futuristic tags, logo-adorned elastics, and even delicate chains are making all of our preconceived notions disappear. Believe it or not, thong sandals are a thing. After seeing the shoe style paired with suits, skirts, and even lace, we have a feeling this sleek version of thong sandals will have a huge place in our wardrobes come spring. This is one shoe trend that's truly out of this world. Much to our surprise, designers accompanied their fresh flock of spring trends with shoes that looked like they belong in another galaxy. One look at these sculptural heels and you'll be wondering why you ever walked on a regular heel in the first place. With heels like these, your outfit will be elevated taken to new heights with little to no effort. We've discussed this shoe trend in length, but that doesn't mean these shoes get any easier to look at. But for whatever reason, despite their "dorky" nature, they read fresh and cool. This year, it's time you step up your sneaker game and the spring/summer 2019 collections are here to help you out. Whether your go-to sneaker style is—athletic, classic, or forward—it's time you take it to the next level. Since you're probably ready to shop go ahead to shop the top three spring fashion trends to invest in according to a stylist.